I wasn't planning a craftalong post for today, but then I received a special surprise in the mail and I just have to share because it totally fits into the Dala-theme! My bestest friend in the whole world sent this to me and Ryan as our wedding gift! 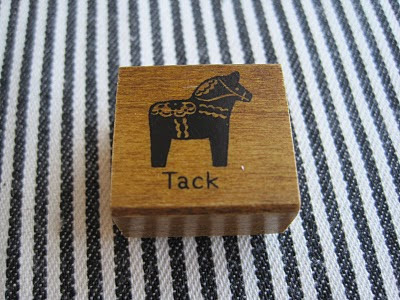 It's from a little Swedish shop called Hemslojd. One one side it says "welcome" in Swedish and the other side is our last name. It's meant for hanging, so Ryan and I have to go get a couple hooks to hang it on. Yay for another trip to IKEA! Welcome! If you're not familiar with what's happening over here, you're in for quite a treat. 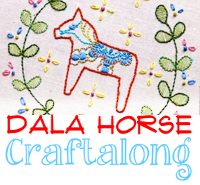 Carina of Carina's Craftblog, Pam of Gingerbread Snowflakes, Hanna of iHanna, and myself are taking part in a Dala Horse Craftalong. 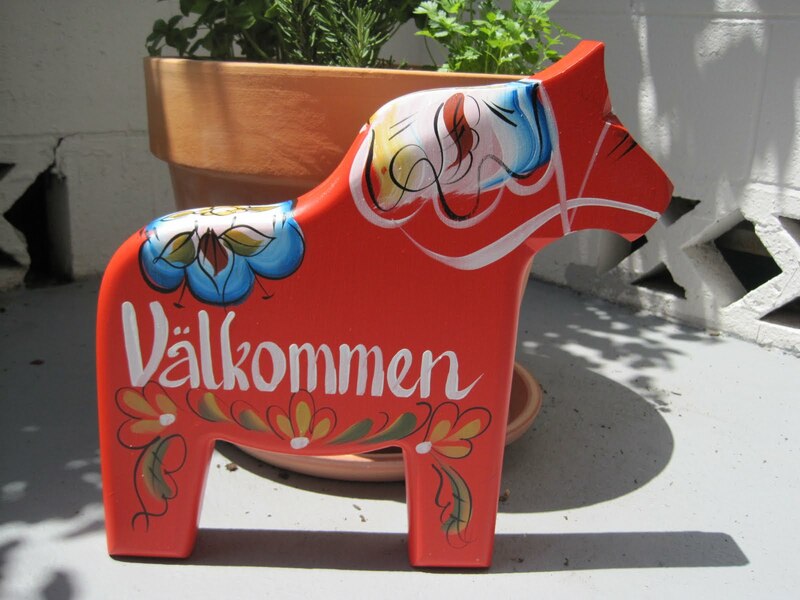 And we want all of you to join in the Dala Horse fun! 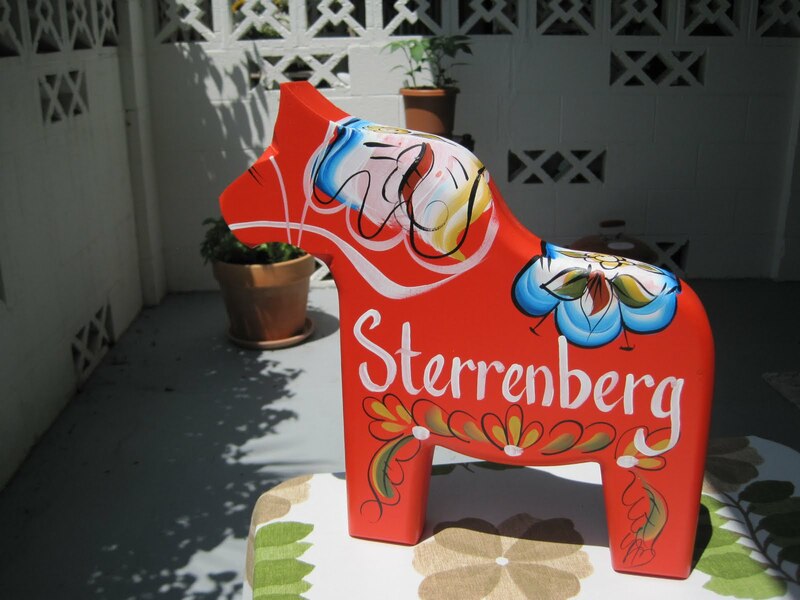 Create something inspired by the Dala Horse, anything you want and upload any pictures to the Flickr group here. So, for my first Dala Horse project, I used this adorable fabric I found in Japan. I bought it not knowing what I would make with it. And I used up 1/2 of it making this apron. This is one easy-peasy apron to make. Not only is it cute, but it's practical. I especially love wearing tea aprons when I'm washing dishes. If I had thought ahead to how much I love wearing tea aprons while washing dishes I would have added some oilcloth backing...alas, I just now am realizing this. I'm working on a tutorial for this very apron, a scalloped-edge, easy-peasy, Dala Horsey apron. 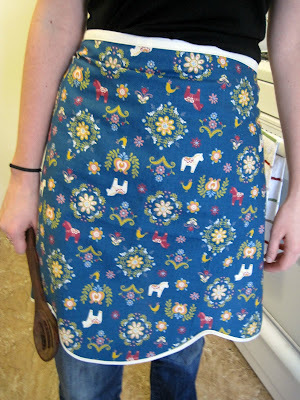 So you too can have yourself a Dala Horse apron. 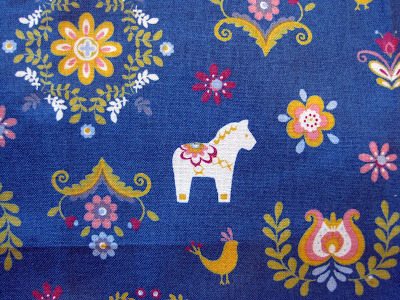 You could even use Carina's super-cute Dala Horse fabric! Yup, you heard me right, a Dala Horse Craftalong! 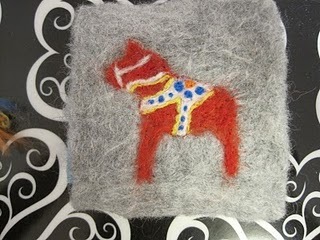 Pam of Gingerbread Snowflakes rounded up a few of us Scandinavian crafters to start a Dala Horse Craftalong! So together with Carina of Carina's Craftblog, and Hanna of iHanna, we will be conducting a fun craftalong with all of you crafty folks out there to join in! So what is a craftalong, you ask? Well, this is how it will work. The 4 of us will all be blogging for a month about Dala Horse themed crafts and offering helpful how-to's and tips. And we're asking you to join in the fun by creating either one of our projects or create your very own! Then once you get started, upload some of your progress over at the Flikcr group here. 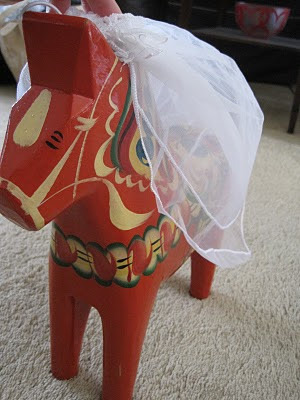 And, the Dala bridal horse. Please join in the fun! I am currently working on many fun projects including a Dala apron, a Dala hot pad, Dala coasters....and so much more! Pam has made some pretty impressive 3D Dala horses along with some ornaments. And Carina has a freakin' sweet Dala embroidery pattern to check out, and Hanna has some sweet photos of the actual city where it all started! I can't wait to see what all of you come up with, please join in the fun! I would like to say a quick hello to everyone after my hiatus from the blogging world. Ryan and I are officially married and moved into our new place out in California! After many weeks of living out of a suitcase and traveling cross-country, it feels good to be finally getting settled in. I'll share more pictures at a later date and time, I want to do one giant wedding post. I'm still getting my "crafting corner" in order, but the crafts are starting even without it being finished. And stay tuned...tomorrow is going to be quite a spectacular start to a new series!